Top quality 3-ply. Dyed tissue. Coined embossed edge. Absorbent. Dyed tissue. Airlaid. Upcharge applies. Elegant European Stardream with iridescent finish. Single-sided color. Pindot embossed edge. Upcharge applies. Exclusive FYP patterns. Single-sided color. Pindot embossed edge. Upcharge applies. Basketweave texture. Single-sided color. Upcharge applies. FYP offers 3-ply Napkins with and without embossed borders, 3-ply Shimmer Napkins with a pin-dot embossed border, 3-ply Patterned Napkins with a pin-dot embossed border, air laid Linen Like Napkins and select 4-ply Napkins. Personalize your Napkins with text and illustrations from our extensive, designer-curated collection. With over 150 fonts, 50 foil colors and 1,300 clipart images, you can create the perfect party accessories for your event. You also have the option to Upload Your Own Art for a truly unique product. 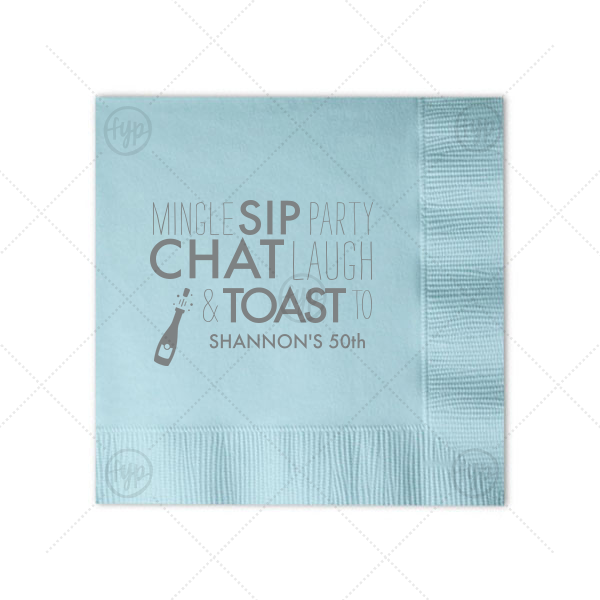 ForYourParty's personalized Mingle, Sip, Party Cocktail Napkins are a perfect design for almost any occassion. It's time to show off your fabulous taste with custom designed cocktail napkins at your next event! Orders delivered as soon as 04.29.2019. Exclusions apply.